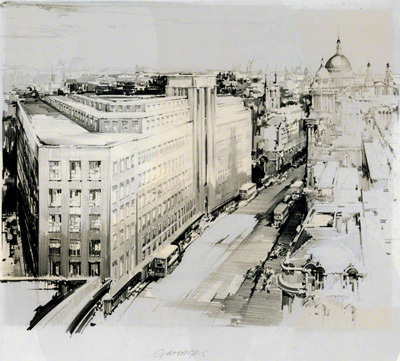 A Pencil drawing of the Gamages Department Store in central London looking towards St Paul’s from Holborn Circus. This drawing may have been a proposal or may have been the actual store as it existed in the 1950’s. Claude Buckle makes the pencil drawing with strong architectural lines and with some artistic licence to enhance the scene. (St Paul’s is actually more to the right) Created in 1955.